BONES is back for its 11th season, and when things pick up, it’s months after Booth and Brennan left their jobs to start over. Unfortunately, things aren’t super great — Booth goes missing, and Kim Raver’s Agent Miller is recruited to help find him. 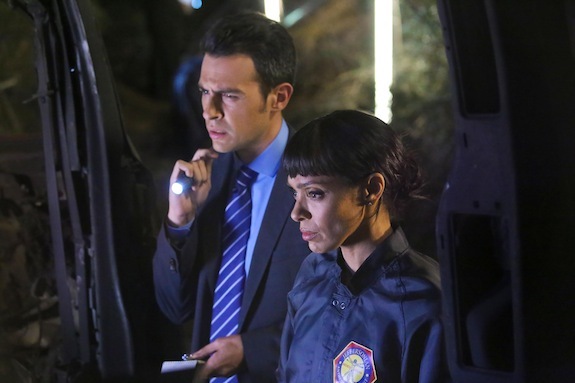 BONES has been off the air for months, and the Fox drama finally is back this Thursday with the first of 12 new episodes. BONES has been off the air since its 200th episode aired in December, and there are still a few more weeks until the show returns. Which brings us to BONES’ 200th episode celebration. BONES’ 200th episode is airing this Thursday, and as Fox Television Group Chairman and CEO Gary Newman pointed out during an on-set celebration, it’s one of only a few Fox shows to reach that incredible milestone. BONES is telling a different kind of story for its 200th episode — sure, a body is discovered, but the episode is set in Hollywood in the 1950s, and Brennan is a cop, while Booth is a jewel thief. BONES viewers have been getting to know squintern Arastoo since his season 4 introduction, but in light of his serious relationship with Cam, his parents will finally be introduced in Monday’s brand new episode, “The Cold in the Case.” And in the tradition of BONES characters being given incredible actors/performers to portray their parents (Ryan O’Neal, Billy Gibbons, and Joanna Cassidy), the series recruited Emmy-winner/Academy Award-nominee Shohreh Aghdashloo to play Arastoo’s mother. And while Arastoo is wary of what his mother’s intentions might be in wanting to meet Cam, Aghdashloo could relate to the protectiveness she got to display as Deena. BONES’ Cam and Arastoo have been in a relationship for about a year and a half, but in Monday’s brand new episode, “The Cold in the Case,” they face a common speed bump couples face: stress about meeting the parents. The fallout from the dinner for the duo has an unintended impact — Cam, who has always attempted to keep personal matters out of the workplace, won’t be able to hide some of the tension she’s facing in her relationship with Arastoo. The BONES squinterns have been a part of the series since season 4, but for the first time (in a non-dream setting), Monday’s episode, “The Patriot in Purgatory,” brings all the male squinterns together to tackle a case.